Comments The Imperial Golden Yellow topaz is one of the loveliest gemstones. That its rarity makes this gem special aside, the allure of the rich distinct color is hard to resist. Featured today is a superfine Imperial Golden Yellow topaz of 3.64 carats from Brazil. The gemstone has a honey gold color with just the right hint of brown and has been set in Sterling silver as a Men’s yellow topaz ring. 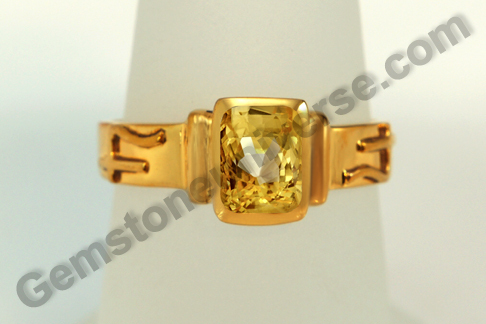 The Imperial golden yellow topaz is completely natural and free from any treatment or enhancement. This particular gem is eye clean and has electric lustre. Imperial golden yellow topaz is the substitute gem for natural yellow sapphire and is used to harness the benevolent energies of Jupiter also known as Brihaspati/ Guru. The USP of the Imperial golden yellow topaz is that it has a very distinct look and can be identified easily. It is mined only from Brazil in the Ouro Preto area. Comments The word for lustre in Hindi is tej or kanti. When one speaks about an exceptional person, especially who is spiritually charged and more alive with divine energy (which all of us have in varying levels of nurturance), it is this quality that is the most visible aspect. There is a distinct lustre and aura, that sets this person apart. 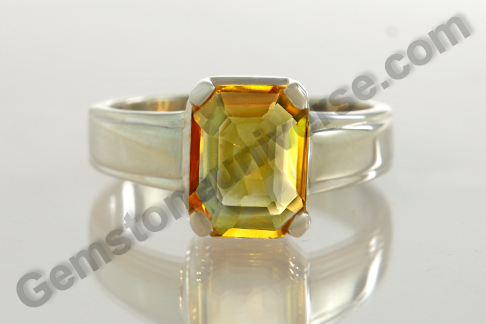 Likewise the gemstone featured today is a Natural Ceylon Yellow Sapphire of amazing lustre and brilliance. Fully natural, unheated and untreated, this gem from the Ratnapura mines of Srilanka has a medium canary yellow color and a fantastic weight of 3.87 carats. 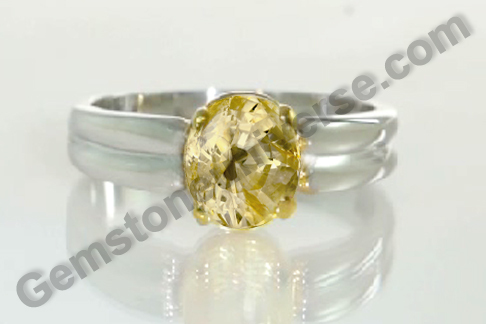 The gem has been set as a yellow sapphire ring in a seat of 22-karat gold and the shanks are sterling silver. Natural Yellow sapphire or Pukhraj is the gemstone of planet Jupiter also known as Guru or Brihaspati, and is a very popular gemstone, especially in India. And just as popular a gemstone it is, the market is equally full or all kinds of material that is passed off as natural yellow sapphire, too-good-to-be true-yellow colored sapphire ( heated sapphire that is a fraction of the cost of natural yellow sapphire and has no use in planetary gem therapy), yellow topaz, and oftentimes citrine is palmed off to the unsuspecting buyer. Please insist on getting gem certificates from your seller. 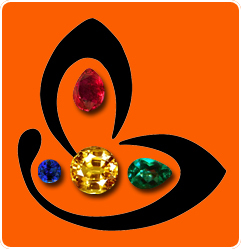 As much as we’d like you to benefit from planetary gem therapy, we would also like you to become an intelligent buyer, for your own sake so that the gem therapy is indeed successful. To view the natural yellow sapphire price and inventory, please click here. Comments The open skies spell freedom and that is the feeling that the soul craves for. After all, when there is freedom, life is able to flow on its course with a surprising ease.Featured today is a natural Ceylon Blue Sapphire of such a soul enriching color of the skies. Fully natural, unheated and free from any treatment, this gem of 3.55 carats is a cherished piece from the Ratnapura mines of Srilanka. 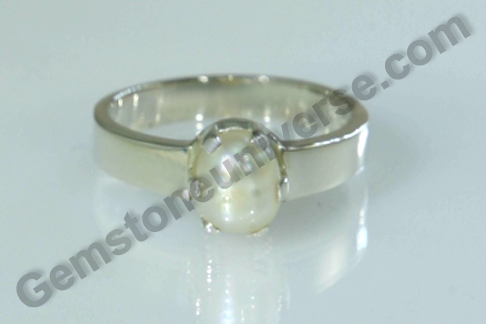 Super lustrous and clear, it has been set in Sterling silver as a Saturn talisman ring. This Blue sapphire ring has the symbol of Saturn standing in relief on the shanks. Blue sapphire or neelam gemstone is the gem of Lord Saturn or Shanidev. It is used to harness the potential of a powerful Saturn in an individual’s birth chart. Such is the power of this gem that a blue sapphire should always be worn after getting a proper gem recommendation and ascertained for favourability. Saturn is a karmic planet and its periods are the phases of retribution in life. It is the time when he balances the karma books and metes out absolute justice. A favourably placed Saturn can bestow many fortunes and blessings and a saatvik talisman made out of a natural blue sapphire is a potent tool to harness his energies. Comments The striking aspect of the colors yellow and gold is that there is a undercurrent of auspiciousness and prosperity that courses through these hues. These colors are warm and inspire a subtle strength and security. Featured today is an alluring rich Ceylon Yellow Sapphire – a completely natural, unheated and treatment free gem having a nice jyotish weight of 2.56 carats. The cushion cut and canary yellow sapphire is striking with its clarity and exceptional lustre. The gem has been set in a 22 karat gold ring. Note that the symbol of Jupiter stands in relief on the shanks. Natural Yellow sapphire or Pukhraj stone is the gem of Jupiter also known as Brihaspati or Guru. 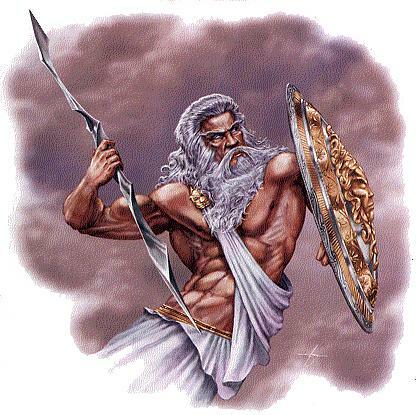 It will be of some interest to note that Jupiter is the Roman equivalent of Greek Zeus and notably of the Aryan deity, from the Vedic times referred to as Dyauspitr, which gets translated as Shining Father Sky. Essentially meaning to say that the representative energies are universally one and difference only lies in the various names given by man. The saatvik benevolent energies of Jupiter, who is also the mentor of the gods can be harness through a talisman with a natural Yellow sapphire that has been duly consecrated and energised. Comments Strength has its own dimensions. They are intangibles, parameters that require clever description. However, nature has done us a favour and all you have to do is look at this coral. Featured today is a robust and ruddy red coral. This natural and organic Italian red coral of 4.63 carats has been set in sterling silver as a pendant. The organic red coral has the coveted and finest Mediterranean ox blood color and has a smooth blemish free surface. 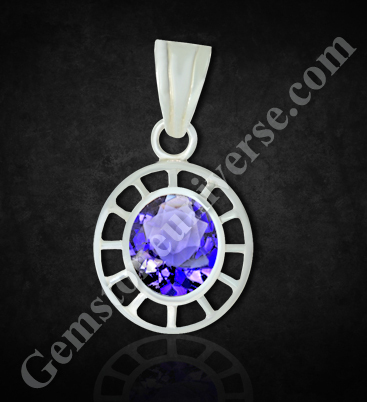 The gem has been fashioned as a cabochon and is an oblong oval in shape. This Italian red coral is completely natural and free from any kind of treatment. 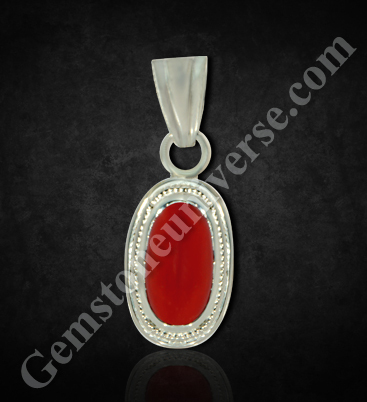 Natural red coral/ moonga gemstone is the gemstone of Mars also known as mangal/ angaraka/ kuja. Its robust redness is representative of the strength, vigor, vitality and courage that Mars is all about. According to Vedic astrology, the saatvik energies of a genuine natural red coral can be used to gain benefit from a well-placed Mars in one’s birth chart. Comments When an individual opts for planetary gem therapy, it does not have to be staid. It can be creative and beautiful besides being powerful at the same time. 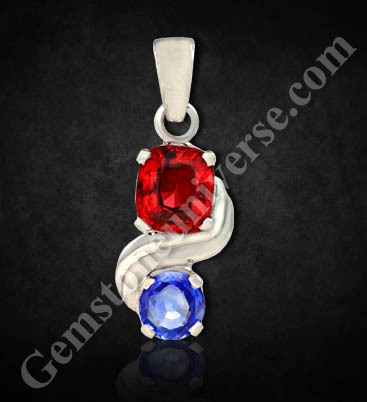 Featured today is a pendant that is an amazing blend of harmony of two planetary energies. There is the stupendous natural hessonite garnet from Sri Lanka of 4. 08 carats, which has a gorgeous burnt cinnamon color with excellent lustre and clarity. 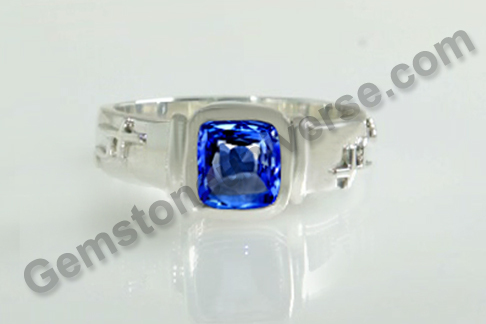 Then there is the natural Ceylon Blue sapphire of 1.83 carats of intense sky blue color. 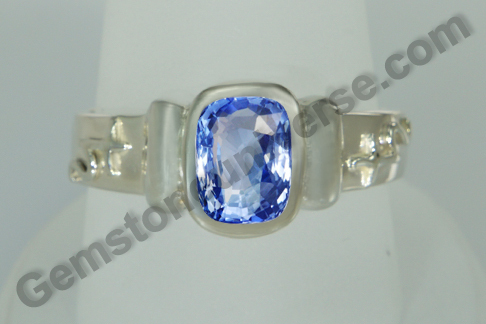 The gem has excellent clarity and has electric lustre. In Vedic astrology, hessonite is the gemstone of Rahu or North node of the Moon and Blue Sapphire is the gemstone of Lord Saturn and the gems are used to harness these planetary energies. One of the dictums of Vedic astrology goes thus- “Shani vat Rahu” , meaning that Rahu’s workings and results are in the likeness of Shani/ Saturn’s workings and results. Since these energies are not mutually inimical and are significators for the patron, the harmony pendant with both gems works out powerfully and aesthetically too. Comments The treasure box of Africa opened suddenly when the Burmese jewel box seemed to elude and out came magnificent rubies – the crowning glory of gem world. Featured today is a spectacular and splendid Ruby from Mozambique. This beautiful natural, unheated and untreated oval cut ruby is a deep vibrant reddish pink in color and is set in a 22-karat gold ruby ring. Note that the symbol of Surya stands in relief on the shanks of the ring. This natural ruby is a class apart, distinguished by its fire and electric lustre. The gem is an eye clean beauty and allows for the magic to be accentuated by the play of light. 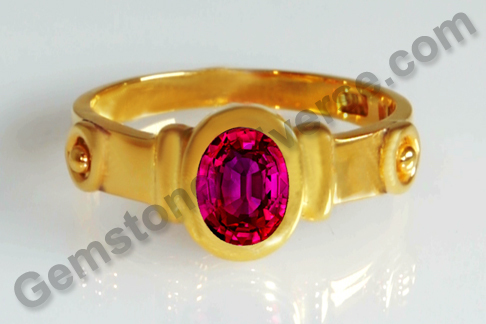 Natural Ruby or maanik/ manik stone is the gemstone of the Sun or Surya, according to Vedic Astrology. A flawless natural ruby set in a talisman is the most potent astrological tool for harnessing energies of the Sun. To view the natural Ruby Price and inventory, please click here.